I have been summoned for Jury Service. Starting from tomorrow, I have (at least) two weeks of hanging around and a surprising amount of time-off to fill. So, I’ve decided to hold a personal film festival. For each of the ten working days that I’m on duty, there will be a film which I really should have seen but have not. The list is an eclectic one. Tomorrow, I start with Tim Burton’s Big Fish, and then go back to the 1966 British classic, Blow-Up, before continuing with the British feel by taking a very overdue look at Chris Morris’ Four Lions. The first week is rounded off with Henry Selick’s much-admired animation Coraline and Aronofsky’s apparently devastating Requiem for a Dream. The second week has a slightly older feel, beginning with Bill Forsyth’s Local Hero, and then the closest thing Disney has to a cult movie, One of Our Dinosaurs is Missing. 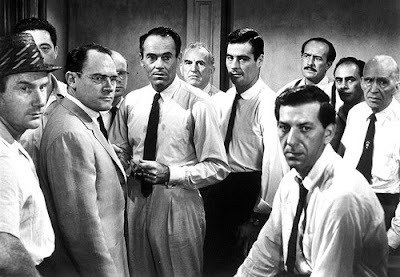 I finally get round to seeing the original Planet of the Apes, before the legal theme of the fortnight rears its head with the abortion drama Vera Drake, before I finish with the film that no jury service would be complete without: 12 Angry Men. I approach this with far greater anticipation than I do my civic duty, and invite you all to watch along with me. Reviews will be up before the beginning of the following working day and it would be great to share views with you.